We offer a large selection of quality USA made creature baits and tubes. 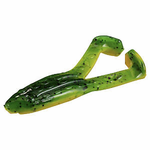 These creature baits include lizards, eels, frogs, craws, and more. You can't go wrong when you have some LLO Creatures in your tackle box. Creatures can be rigged several different ways, which makes them very fun to fish. Some of the biggest bass have been caught on soft plastic lizards and soft plastic frogs. You may just find your next favorite creature bait here. Our tubes are high quality and hand poured.